Mothers’ Milk Bank Northeast follows strict screening, processing, and dispensing guidelines established by the Human Milk Banking Association of North America (HMBANA) in consultation with the Centers for Disease Control, Food and Drug Administration, New York State Department of Health, and the blood and tissue banking industries. Milk donors are healthy, lactating women with surplus milk, and babies of any age. Bereaved and surrogate mothers may also donate. Donors are not paid; they give their milk for altruistic reasons only, which eliminates incentives to tamper with milk or provide inaccurate health information. Donor milk arrives frozen and is carefully logged and stored. 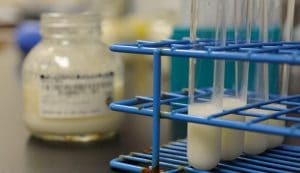 Milk from 2-4 donors is thawed overnight in a refrigerator, pooled, carefully mixed to ensure an even distribution of milk components, and poured into bottles by trained technicians in our FDA-regulated laboratory. Trays of milk bottles are heated in a shaking water bath using the Holder Method of pasteurization (62.5◦C for 30 minutes). Pasteurization eliminates bacteria while retaining the majority of the milk’s beneficial components. Cytomegalovirus (CMV) is among the pathogens destroyed during pasteurization. Pasteurized milk is quick-cooled, then frozen at -20◦C. Pre-pasteurization: Every new donor’s milk undergoes a pre-pasteurization culture to screen for heat-resistant pathogens. Testing is repeated every 3 months. Post-pasteurization: One bottle from each pasteurized tray is sent to an independent laboratory for microbiological cultures to verify zero growth of bacteria after the heating process. Any milk with a positive culture is discarded and not dispensed. Each bottle is labeled with an expiration date 1 year after the earliest pump date in the batch. Milk is shipped overnight in coolers with dry ice to arrive frozen by 10:30 am the following day. These multiple overlapping screening and safety steps ensure that pasteurized donor human milk is safe for the most vulnerable infants. In over 40 years of modern milk banking there has never been a documented case of an infant being harmed by donor milk. Mothers’ Milk Bank Northeast: Safe. Trusted. Lifesaving.